The small village of Hailsham sits in rural East Sussex, not far from the Sussex coast at Hastings. 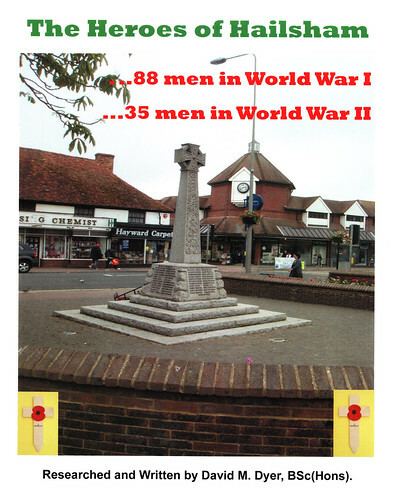 The local war memorial lists 88 dead from the Great War and 35 from the Second World War, a typical casualty roll for country villages like Hailsham. The author has adopted a traditional format to the book for War Memorial productions. He explains a little about the local memorials that exist and then a page or more is devoted to each casualty, describing their military career and the battle in which they died. Portrait photographs are provided for the vast majority and where these are not available photographs of graves or names on memorials to the missing overseas. The section on WW2 follows a similar approach. One of Hailsham’s Great War heroes was Nelson Victor Carter VC. Carter was awarded a posthumous VC while serving with the South Downs battalions at Richebourg and while he lived in Eastbourne in 1914, his Hailsham roots are often forgotten, so it was good to see this section of the book; Carter is given a full chapter to himself. The section on additional information was interesting, especially where the author breaks down the casualties on the memorial in terms of statistics, showing for example that most men on the memorial were aged between 21 and 25. One other casualty in the book that attracted my attention was Frederick Marillier. I wrote about him in my own book Walking The Salient so it was interesting to read more details about him and see a photograph. Frederick came from a well-to-do Sussex family but enlisted as a common soldier, was decorated with a DCM and given a battlefield commission, until he fell in Flanders in 1914. A short war, and all too common when reading stories of other Hailsham Heroes in the book. David Dyer has done a good job of bringing all the sources together in one publication, adding more to what we know about this men from Sussex who gave their all, and it is certainly a very modestly priced book, with some of the profits going to the Royal British Legion and Thank The Forces. A good little production that does the Heroes of Hailsham proud; they are just names no longer.